Why should you rebrand? How should you rebrand? Find out all of this and more from our experience building the new Blinkist. Two weeks ago we launched a completely revamped brand, complete with new logo, new art direction, new features in the app, and a whole bunch of fun extras. As the rebrand project started picking up steam in the late summer, we realized that this was a really cool opportunity to try and tell the story of a rebrand from inside. Up close and personal. There was some high drama around the office: Would we finish on time? Would Apple and Google feature the app worldwide, as they hinted to us? How would our users take to the new look and feel of Blinkist” Ben started interviewing people around the office. He talked to founders, people from mobile development, product managers, designers, and more. This episode of the Blinkist podcast is the story of a rebrand. The story of how the new Blinkist came to be. NIKLAS: So basically we decided a year ago to work on the rebranding. 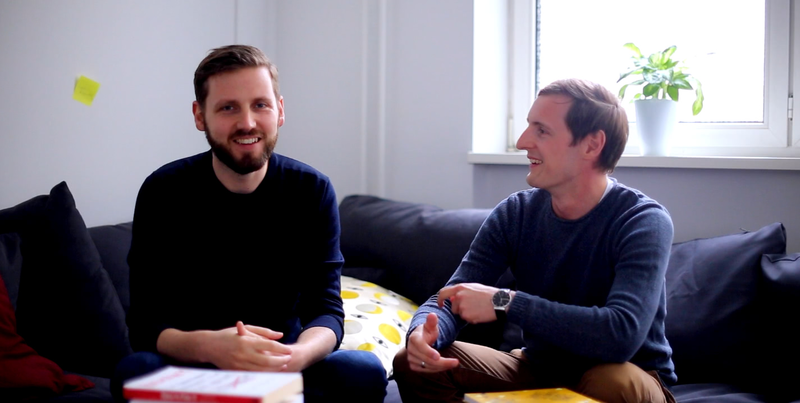 BEN: Niklas Jansen and Holger Seim, two of the Blinkist co-founders, eventually agreed that it all started after they closed a series A of funding last winter. NIKLAS: It was just a feeling that we felt, we need to change something. NIKLAS: We felt that the current brand didn’t really reflect the team and the purpose anymore. 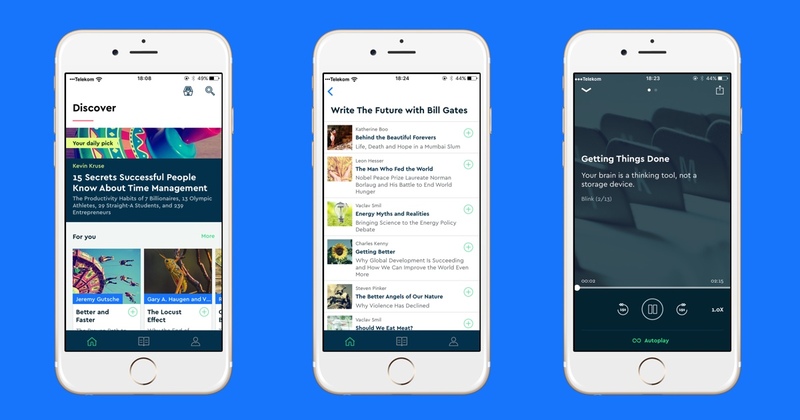 HOLGER: We felt like it’s time to give Blinkist a new look and feel to reflect where we were at. BEN: By the way, he’s talking in September, before the rebrand. HOLGER: What people see today, the foundation for this has been laid down like three years ago. We’ve launched a podcast since then, we’ve launched a magazine since then, we have the Blinkist Minute, which has been launched a month ago. 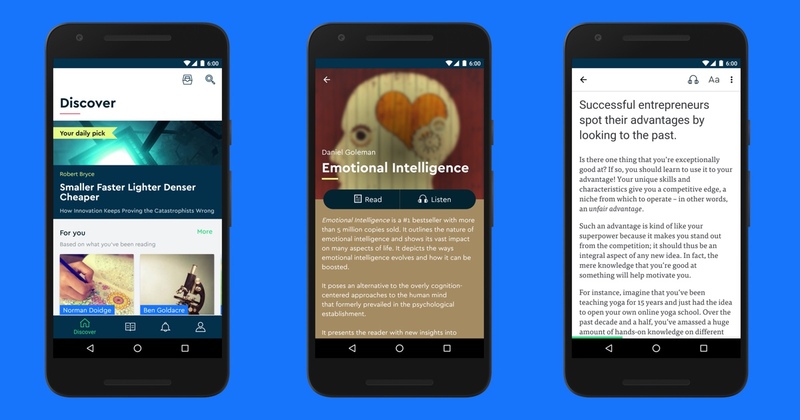 So there are more things than just the app Blinkist that help people to learn. Blinkist was going to be four years old this year, and for some time already, people felt that an overhaul was necessary. HOLGER: So we said, OK, let’s focus on the fundraising. But after the fundraising we’ll be able to hire new people, we’ll get in some new talent, some new skills. BEN: That’s Sarah Moriarty, head of Brand Marketing. SARAH: One of the first projects that I worked on was this external rebranding project. So this idea of, who are we, what do we stand for? What kind of company are we, and what kind of company do we want to be? At the beginning of the rebrand project, what was clear was that the way people outside of Blinkist saw the company was different than how people inside the company saw what they were doing. That’s a pretty dangerous gap, and it can have ramifications across a lot of channels. BEN: That’s Emily Phillips, from Customer Communications and Support. EMILY: …and when I began writing it I took it over from another colleague, Caitlin, and the question of Blinkist’s voice, how that either directly or indirectly reflects our brand was a question from day one: “OK, how are we defining this, do we have guidelines?” And it was more of a, I wouldn’t say shooting from the hip by any means, but there wasn’t like a definition. We thought we knew how we communicated and what we were communicating but it was still never quite laid out. Chapter 2, part 1. What in the world is a strategic brand? (Clockwise) Gessica, Linh, and Natalia working with App Store screenshots. Observe Natalia’s expressive hand. BEN: “How do we want people to perceive us?” One way you can influence how people perceive you or your company, of course, is to agree within the company on who you are and who you want to be, and what you do and what you want to be doing. Or, to use the buzzwords, you need to align on strategic brand values. Since most companies don’t have the resources to stop what they’re doing, do a whole bunch of market research to figure out how they’re perceived, they hire fancy branding agencies to do it for them. Blinkist did that too. 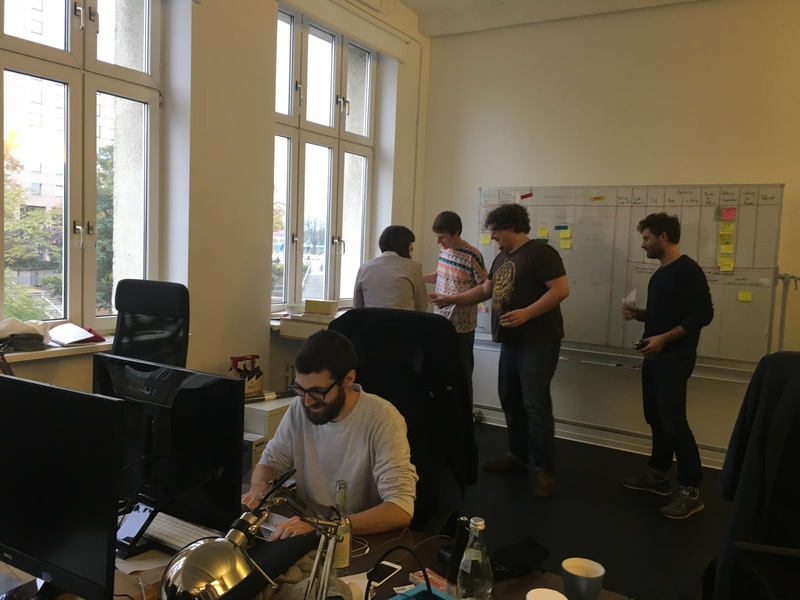 NIKLAS: So once we decided for one agency, we collected the team of six or seven people from Blinkist, from different teams and different backgrounds. BEN: That’s co-founder Niklas Jansen again. NIKLAS: Had a creative opening workshop with the agency where we collected our input and shared our thoughts on the typical Blinkist customer and the Blinkist purpose. From there the agency took it and helped us define our four P’s, which are Purpose, Promise, Positioning, and Personality. So we took the input from the agency and refined it in our own way – probably four or five people sitting in front of a Google Doc, and fighting about words. It was a really fun experience, especially if you have Germans and Americans fighting about the fine lines, what one word can mean. For Germans it means something else than for an American. This was really fun. CAITLIN: Hi, I am Caitlin and I do stuff with words at Blinkist, so app copy, brand marketing stuff, articles, various on our blogs. We had a series of meetings. It was me and our core brand values which our agency did help us nail down, and our personas, and me looking at those and deciding on how we would talk to those different constituencies and what the core branding messages were for each of them. Where there was overlap and where there was not. I also wrote a tagline. BEN: The agency was cool. They really seemed to get us, and Caitlin liked working with them. They helped us express who we feel we are and picture who our users are. There was a buzz in the office every time our team met with them. So Caitlin got to work taking these branding messages, user personas, and brand possibilities, and making a foundation out of it. She describes them as geographical features. CAITLIN: I would describe what I have been working on, if all of those are like mountains and rivers and little houses. What I have been working on is the terrain that they build them on. Stuff that informs how you’ll build the foundation that tells you whether or not you can build a three- story house here and what it has to look like on the outside, you are not going to build a teepee on the side of a blizzardy mountain. It’s helping to set the landscape for the people who need to design things that will live in it and make sense. BEN: I asked Caitlin why this foundation, why shaping this idea of us in the world really matters for the company. I started this section by asking how people perceive us and how we want to be perceived. Do we really have to go that deep when we think about how we come across to others? Is that really necessary? I didn’t mean to make it such an existential question, but I realized pretty quickly that, well, Caitlin can say it better. CAITLIN: Look, we’ve talked about this before when you’ve asked me: “What is a brand, why do people get so scared of it? Why is a rebrand scary?” Because when you decide to use a product, when you decide that you like something or don’t, you are deciding based upon whether or not you want to make that personal association. There’s a reason for when you were a kid that you befriended some kids on the playground, and to others you were like: Whoa, you are not cool enough for me. Deciding on whether you like a brand or not is a very personal choice and people get nervous about rebrands and people react very strongly to, say, new logos because they’ve developed feelings about these brands, a brand is so much more than a logo or a color or a typeface, it’s a whole world to fill with associations that you can’t really control. BEN: When it comes to a brand, how a company is perceived, how people feel when they interact with it – that’s everything. So you need to decide what your brand values are – for that the agency was a big help – and that covers a lot. But that’s not enough, because the brand values don’t mean anything if the company, the product, the people in the company, don’t internalize those brand values also. That’s like, some organic brand selling some dubious bacon. Then you’re again at risk of what Emily and Holger talked about, a newsletter saying one thing and a Facebook post saying another. SARAH: When you have brand values they represent something specific, and something important about the brand that you have, but also about the brand that you want to be. BEN: That’s Sarah Moriarty again. She’s talking about how to implement the brand values Caitlin talked about in a way that makes actual impact both inside the company and outside of it. SARAH: And that people can keep them in their mind and use them, draw on them, all of the time in every single thing that they do every day, so that whenever a user or prospective user or somebody who just hears about Blinkist and decides to visit us whether it’s on the website, the social media, opening up the app, receiving a push notification – they feel something, like a human touch. So the point of the values is that people are all thinking in this same way when they do their disparate tasks so there’s a uniformity in the feeling for anyone, whenever they come to Blinkist. BEN: Thanks to the agency and a few people from different parts of the company, the team was really re-defining Blinkist in a way that everyone in the company could get behind. This rebrand thing wasn’t so hard after all. Next up: a new logo. Everyone was excited about a new look, the face of a new brand. What would the agency come up with”HOLGER: The old logo, the logo that you see right now is still kind of, inspired by a book, and we wanted to leave that focus on books so that’s why you see the new logo will not have a relation to books anymore and it’s not only about the logo it’s also about the communication: what is our promise to users? NIKLAS: Once we had nailed the communications we started working on the new logo and new art direction. We started doing this with the agency again but really soon we realized this is not going to happen, we’re not going to get to a result that we’re happy with, so we decided to do it internally. And assembled, again, again, again, another team of creative people from Blinkist to work on the new logo and art direction. BEN: So we had no logo and didn’t want to start all over with another – expensive – agency. We were all on our own. This was back in the spring, in March, and at the middle of it all was one of the designers, Natalia Piana. NATALIA: In March, I think they were supposed to have a final outcome. And then we weren’t happy with their three main directions. None of them were – either very fantastic or not even convincing. So I think Niklas freaked out a little bit and I was there, I happened to be there. He was just like, “OK, let’s fix what they have,” then we realized that didn’t work, just fixing what they produced. So we had to start over and we came up with a structure, a process, workshops. BEN: Were you freaking out”NATALIA: I freaked out. Many times. During this. I really felt the pressure. BEN: What were you afraid of”NATALIA: Well, first of all I was designing for us, so the main fear was like everyone’s going to be unhappy or not many people are going to embrace it. BEN: Here’s co-founder Holger Seim. HOLGER: The logo is kind of the most important piece, or everything from the brand comes down to that logo so it’s probably one of the most important results from that rebranding. Everyone, including me, had a really strong opinion about the logo. So I provided ideas and opinions, which sometimes made Natalia’s life easier, and sometimes harder, but I tried to be supportive in that way but it was also important for everyone involved, I think that in the end we have something that we can be excited about. Not something where we say, well ok it’s nicer than the old logo but maybe not exciting, it’s ok enough. I wanted it to be great. BEN: Now you get why Natalia was feeling the pressure. Sarmishta: Natalia started with a few different concepts. BEN: That’s Sarmishta Pantham, one of the other designers, talking about how the process worked. How they scrambled to make a logo themselves, from scratch. Sarmishta: What exactly does Blinkist personify? So we had this idea of filtering something valuable like a bunch of information or infinite thinking to something finite. NATALIA: I was the one probably in charge of creating and producing visuals. But without them we would’ve ended up with something completely different, like if it was just on my shoulders. So it was good because they put me on the right path – the correct path. Some days when I was trying to come up with concepts, even way late in the process. It was like, maybe I can do something else, maybe I can come up with a librarian! Maybe I can come up with an animal! Or something else. So just to focus on what I already had and just listen more to what they liked, what they thought was strong. SARMISHTA: So then she developed a system that led her to this final logo, and if you look at the logo it has a very specific – it’s very simple but also it’s very harmonic in the sense that it’s got this negative space, a positive space, and very geometric, modular structure. BEN: Wait, I want you to hear Natalia explain it herself. NATALIA: Ok. The white space, so, like the canvas space, it’s the outer world. The world we live in, full of input, full of information, probably too many complex notions that we need to digest and intake. The green represents the Blinkist people, the different circles, coming together, getting together in the circles, which is our structure, and working together. And then on the top there’s this negative space triangle, like a filter, which is there because all the information from the canvas goes in and gets filtered into this darker area, which is the essence, distilled – all the concentrated darker valuable information which is placed there in the middle, in the heart, of the green area. And it’s there. In focus. BEN: Do you like it? Are you happy with it”NATALIA: I like it. I’m happy now. I think conceptually it’s really strong. But this has a whole story behind it, it’s simple, it’s impactful I think, and yes, I think it’s Blinkist. HOLGER: It’s bold. It’s not like some other app. It’s a bold design, which I like. It’s a bold statement and I think most people would be excited. BEN: Now there was a new challenge. The designers had pushed themselves and worked their magic to translate Blinkist’s potential into a beautiful new visual language. It was time to update the apps – iOS, Android, and the web – to reflect that. Oh, and when Apple got wind of it, they promised a global feature. That would mean a surge of new users. It also meant new deadlines. And more pressure. NIKLAS: So once we knew we’re going to have a new brand, or an updated brand, the question was how we’re going to unveil it to the public, and for us it’s very important that the new brand is reflected in the apps as well. NIKLAS: So we just didn’t want to paint the app in new colors, but we really wanted to improve the apps as well for our customers. So we made a plan for what we want to improve, what features we want to add, what we want to remove, to make the product better. And from there on we started working on improving the apps. BEN: Getting this project organized fell to Eveline Moczko. BEN: Eveline’s goal was twofold: Update the app with new features, so that Blinkist could re-launch as a new brand and have cool new features that users can actually use, and convince Apple and the Google Play store to feature the app worldwide when it came out. I spoke to Evelin in early October – a few weeks before the launch – and she described how they planned to do that. EVELINE: So we met in July. This was all laid out in July. What we did was reach out to Apple, we told them, hey, we’re planning something big. You featured us before, but you never featured us in the US, but hey, we know why, we had our flaws, we weren’t really a mainstream app. So we showed them basically the new brand, some very first mock-ups about how the app will look. They liked it, and they said yeah, we’ll consider it. Send us a Testflight version one month before. So we said sure one month before. So this was our first big deadline basically. BEN: Of course, the team knew there was no way they could produce a Testflight version that would have the functionality of the completed app one month before the launch. So they had to define the scope of what they’d show Apple. EVELINE: What has to be there is the very first impression that Apple will get. The very first impression of course is the onboarding experience. So we had to do the onboarding experience. We had to do the discover screen, and we had to show which new features we wanted to give the users with this rebranding, which would be the For You – the personal recommendations, which is a new thing – or the curated lists. We didn’t have functionality behind these features so the personal recommendations weren’t actually yet personal recommendations, but for Apple to get the features they just needed the headline and know how it looks. BEN: So that’s cool, that’s like, it’s so thought-out. It’s so structured. It’s kind of like, I’m going to build a bookshelf at home, or something. You guys knew what you’re going to build, and the details of what kind of wood or how it’ll connect to the wall – these were more or less also decided”EVELINE: I think it’s a hard comparison because as you said, I mean, you know how it should look but at the end you’re not thinking about every detail, you can’t. BEN: So building a bookcase is a really good example from somebody who doesn’t appreciate the specific complications. The deadlines were, I would say, massaged a little bit. But about a week before the re-launch, Apple requested feature artwork. That was a good sign. Here’s a tape of a weekly meeting discussing what that could mean. The other voices in there are Clare from Content, Steven from mobile dev, and Tobi, another co-founder and CTO. EVELINE: So, we submitted. We’re approved (Clare: mmhmm) on iOS. EVELINE: Exactly, they requested the artwork, they had an unusually long session for the review. I think that’s a good sign. TOBI: I guess we will get the feature, it’s just a question of if we’ll get it in the US. The German feature we had like 10 times, 100 times already. STEVEN: We’ll get it in Kazakhstan. BEN: I was in that meeting too. What I remember is that it was a bit strange to feel like something so big, something we were all working on, was out of our hands. But a global feature is a big deal. Our numbers show we get 10x as many impressions – that’s people seeing our logo, our new logo – when we get featured in an app store. What would happen if after all this work we don’t get featured? I asked Niklas. NIKLAS: Then – I’m not afraid. I would be disappointed. But I’m not afraid of that. The world will go on. And we’ll work hard to provide them another reason to feature us in the future. BEN: Everyone was really excited about the possible app store feature, but they also knew that focusing only on the feature was missing the point. The point of the rebrand wasn’t to make money fast. It was, as Holger said when we talked, to build a platform. HOLGER: I don’t have the expectation that after re-launch all our metrics are going to look 10x better and this will solve all the challenges we’re facing and will make everything smoother and easier. I see it rather as a good consolidation of what was in our minds. That’s it. It’s a good platform, a good starting point to now, you know, start developing that bigger picture and start to take the next 10x step for the company. BEN: In any case, it was already October, and everyone was trying to finish their things before the launch. BEN: A lot of the last few weeks before the launch were about preparing how we’d tell people about the new Blinkist. 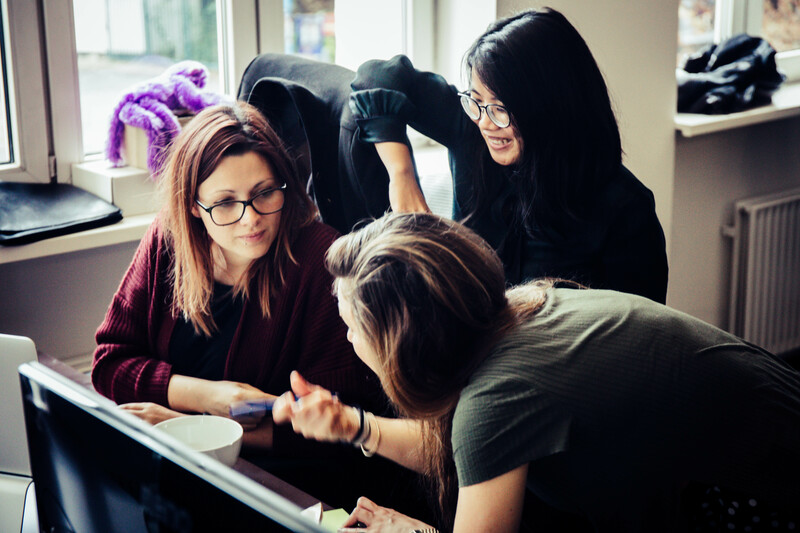 At one point Caitlin sent a document around the office called, “Thoughts Behind In-App Rebrand Language Brush Up.” Here’s a choice quote: “Blinkist is getting older, inside and out. We are moving into ‘Grown up territory’ now and our app is too.” That document was about how we’re going to communicate to people. Meanwhile, every page had to be updated with the new visual identity and communication. Even the emojis. Lotta: It’s basically, just like we’ve been discussing, a lot of what sort of voice and tone we put out there when we’re saying something. BEN: That’s Lotta Kortellio, social media intern, talking about the level of granularity the communication had reached. Lotta: Emojis obviously can reinforce what you’re saying through an emotion, so therefore we can’t just use any emojis, because we have certain brand values that we want to, you know, bring through. So we can’t just use like the poop emoji. BEN: No poop emoji. No guns either. All around the company, people were preparing for the launch. Mobile developers were trying to find bugs, designers were finalizing how everything would look, CRM was preparing a teaser campaign, the newsletters were re-worked and even tech got involved behind the scenes, running smoke tests to see how the servers would handle a potential big influx of new users in the case of a big app store feature. The launch was basically upon us. Everyone was getting excited. Therese, our head of events, made an announcement a day before the launch. THERESE: We’re having a little launch event [woohoo] for the rebranding, there’s a mix of people about 16-20 a mix of Instagrammers, press people, and start-up folks from Berlin. And we’ll do a little launch brunch event for them in the Eatery. I know you’re all super busy so I’m not expecting you to join but of course there will be stuff for you to eat as well, just so you know there will be people in the eatery tomorrow. EVELINE: Well it takes 15 minutes for it to get to the app store so we still have to wait a bit! BEN: The pressing of the button is actually sort of anticlimactic. When the iOS team sent off the test version of the app to Apple for review, they had a big countdown, then hit the button, and the thing took like 30 very awkward seconds to load. Anyway there’s usually too much going on. Execution in reality is tense, painful, minute, sloggy – not as glamorous as pressing a button. BEN: We pressed the buttons today. How’d it go”NATALIA: Not sure. We’re just waiting for the reception and Apple to give us some feedback and maybe feature us. BEN: Are you happy with how it went today”NATALIA: I feel relieved, because the big part is over. There’s more to do, but with more calm. Ben: Are you happy”NATALIA: I’m ok! In the end, Blinkist did get a global feature. We just didn’t realize it was going to be the week of Halloween! So, in the US iTunes store, for example, while the app was featured in the Education section, it was always going to be impossible to make it on to the front page because it’s all just Halloween stuff. Games, stickers, etc. Lots of pumpkins. I think about what Caitlin told me: A rebrand is like a struggle for identity. You create your identity. But that’s not easy. We forget about how hard that was as an adolescent when we were growing up. A company is maybe even harder to build an identity for. You have to get some 40 people to move together as one. If a company is its people, then the new brand reflects Blinkist better. It somehow just feels more like us. Plus it gives us more space to express ourselves further. There are more colors, more grow-up language; we can be who we are. People talk about having a brand that reflects not just who you are, but what you want to be. In that way, the way the rebrand went down is a reflection of Blinkist trying to fulfill its potential. We took things in our own hands and did it our own way, in our own style. And people like it. How cool is that? Ben Schuman-Stoler is a writer and producer from Chicago. At night, he turns into the girl-with-crossed-arms emoji.